We regularly use flooring products by the main manufacturers including Junckers, Bonakemi, Sika, Uzin, Osmo, Arboritec and Granwax. All Bar one, Mitchells & Butler, Bella Italia, Café Rouge, Strada, Zizzi, Pizza Express, Giraffe, Byron, Barbecoa, Bannatynes, Brew Dog, to name but a few. These combined with Village Halls, Schools, Universities are our regular places of work. So if you have a timber floor that needs laying, refinishing or is causing you problems, we will be pleased to help. We used reclaimed pine blocks to fit a new herringbone pattern floor to the Beaumont Hotel in Hexham, Northumberland. Once the floor was laid we sanded the floor and applied a dark oak stain and finished with a satin lacquer. We were commissioned to renovate The Nike Jordan & Regal basketball court in South London. Unlike many courts, we were required to stain the playing area in jet black. We then used white court lines and decals to finish this spectacular basketball court. The woodwork in this JD Wetherspoons pub in Fleet, Hampshire was looking tired and worn due to its heavy traffic. We carried out the stripping of the woodwork bringing it back to bare wood and making any repairs. We then started the french polishing sequence adding colour to the wood to bring out the grain. We then lacquered the wood for durability in a semi-gloss finish. We lifted the existing old pine floor and supplied and fitted a new rustic oak floor to match the existing oak floor in the pub. The works were carried out overnight. We started work at 11pm when the pub closed and then got the pub ready for trading the following morning. We were contracted to take up the existing old flooring which and become very rotten of the years and was far beyond repair. We carried out the works over a number of nights to ensure the venue could carry on trading with as little inconvenience as possible. Here at Renovate, we love everything that is wood and on this occasion, it wasn't the floor that needed our attention. The bar itself in this trendy North London pub was in a sorry state with a lot or marks, dents, chips and stains. Our team of French Polishing experts were on site to strip and prepare the bar surface ready for French Polishing. We were contracted to replace the existing treads and risers on the wooden stairs. We removed the existing treads & risers and scraped off the existing residue to allow the new steps to fit in neatly. We then supplied and fitted the new prefinished oak boards to the treads and risers. The Old Pheasant in Glaston, Oakham is a country bar, restaurant & hotel. We were contracted to refurbish the existing pine floor and bring it back to it's former glory whilst keeping it's country rustic look. This is an old pine floor which needed some board repairs carrying out before we could sand it. Once the repairs had been carried out we fully sanded the entire floor. Due to the original state of the floor it required a hard sand. Once the floor is clean and flat it was just a matter of grading the floor. Stapleford Park is a Grade I listed country house in Stapleford, near Melton Mowbray in Leicestershire, which is now used as a hotel. We carried out sanding and repair works to the entrance lobby and the main hall wooden floors. We were approached by a large pub renovation company to sand, stain and seal the pub floors. They wanted the work doing overnight. The pub wanted to keep trading so our hours of work were limited to midnight until 8 am. As you can see from the pictures the floor was rather tired. We carry out work all over the UK for JD Wetherspoon pubs & bars. 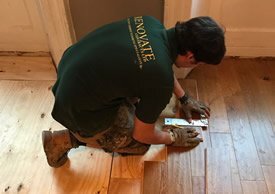 Renovate have built up a good working relationship with the area managers and we are refurbishing the floors in very small time frames. Keeping the pubs trading with very little inconvenience. A very popular gastro-pub in southwest London. The original floors were looking tired from the large volume of traffic. We supplied and fitted new oak flooring and then sanded and sealed the new and existing floors. We were contracted to refurbish the Maple floor in the school hall. We repaired the floor where the sections were missing and where oak had been used instead of maple. We fully sand the floor taking extra care were the boards changed direction and around electrical boxes in the floor. We then applied four coats of Juncker's Hp. To protect the floor and to make it easier to keep clean. We carried out a lot of repairs to the existing floor and supplied and laid a new solid oak floor to an additional area. We then fully sanded the staircase, Both the new and existing floors and filled all gaps. This is a Gransprung floor by Granwood. Granwood block floors are a combination of sawdust, cement, and fillers which are heavily compressed into a block shape. The blocks are then totally saturated in linseed oil and then stacked to allow them to mature. This process meant Granwood floors were almost entirely free from expansion and contraction. The Floors were fitted and the doors infilled by our team of experienced fitters. The floor was fitted in a Broderie pattern. A design that uses large herringbone blocks in a weave over diagonal grained accent squares, to give a heavily textured floor with an almost three-dimensional appearance. We were asked to renovate the wooden floors of University of South Wales' sports centre & gym during the summer of 2013. 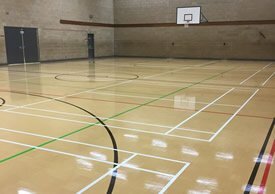 We carried out sanding and coating of the gym and sporting hall. We applied two coats of Granguard to both floor surfaces, this gives the floor the correct amount of traction & makes cleaning and maintenance easier and improves the appearance of the floor. Sanding of Timber Lattice - we sanded the lattice using hand-held sanders only, working carefully up to the edge of the tile, we sanded to a 100 grit finish, hoovered, wiped and applied two coats of Junckers Commercial HP Floor Seal.